For this age group, the most popular dolls by far fit into the size range between 45 to 50cm. As a result of their popularity, manufacturers also create lots of different sets of dolls clothes and other accessories which all add to the play experience. The dolls that we concentrate on here are the dolls in this size range that have the best ranges of accessories available because when you buy a doll you want to know that it is easy to buy more dolls clothes and furniture etc. so all of these dolls are Petalina’s favourites. 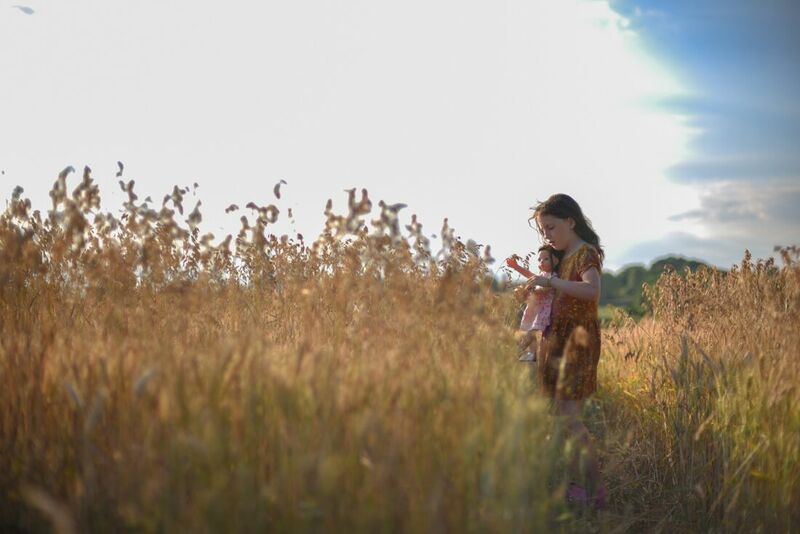 You may want to read through the first article in the series that is designed to help you decide which doll features would be best for your little girl ie. body type, hair and eyes, and the age groups that these are most suited too. These extremely popular, gorgeous girls are 46cm dolls with rooted hair, closing eyes, a flesh coloured soft body and articulated limbs. Fans of American Girl dolls will find that they look very familiar because Gotz were the first company to make American Girl dolls for Pleasant Rowland when she launched the American Girl brand, and the two makes of dolls still share many features. Because of their closing eyes, soft bodies and rounded cheeks, I recommend these dolls to lots of customers for girls of age 4 to 6 because they are grown up but have closing eyes which younger girls seem to prefer. They are also cuddly for bed time. 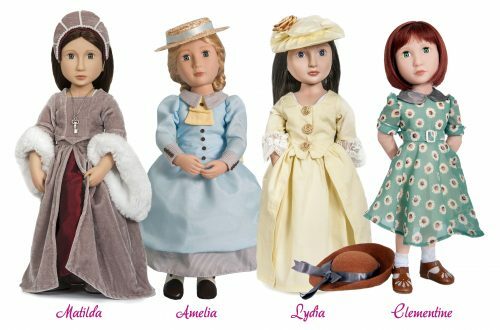 Having said that, American Girl recommend their dolls for age 8+ so there is no reason why these lovely Precious Day dolls will not make older girls very happy too. Gotz make lots of extra clothes and accessories to fit the Precious Day dolls. Some of the clothes are aimed at younger girls such as the Princess Set and Ballet Set but there are also lots of trendy outfits for the more fashion conscious older girl. Jessica has blonde hair and blue eyes and Elisabeth has brown hair and brown eyes, and as of 2018 Julia with red hair is available again. Every year new dolls are added so there are quite a few variations of each now available including a Jessica without clothes who can be dressed in an outfit of choice. The Gotz Girls 45-50cm clothes all fit these dolls beautifully along with some of the outfits for Bonnie & Pearl. Gotz Hannah is the most beautiful all vinyl 50cm doll with fixed non closing eyes and rooted hair. She was first designed by Hildegard Gunzel, a highly respected German doll artist and who has worked with Gotz for some time. Hildegard put so much time and attention into the sculpting of Hannah’s face and body that she is standing the test of time and is becoming more and more popular as the years go by. I also love the way that Hannah can be posed so easily and her limbs just stay where they are placed. She really is a very beautiful doll. Every year the range of Hannah dolls and her accessories increases. Each doll arrives in a large presentation box and is dressed in an outfit for a particular interest or activity such as ballet, horse riding or dog walking. Each set includes an extra outfit or some accessories related to that doll’s past time, and each of the different dolls have a set hair and eye colour combination. You will find so many different dolls clothes and accessories available for Hannah dolls. Gotz 45-50cm are the correct size. 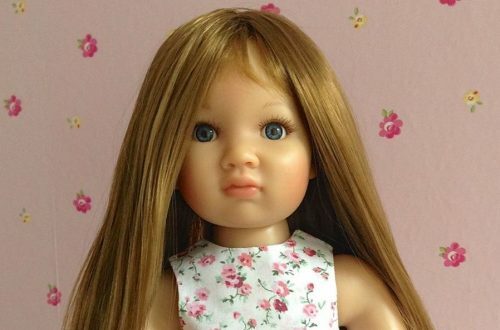 This is a beautiful new British brand of dolls introduced in 2013. 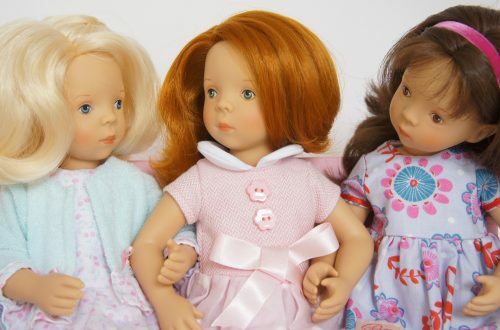 The dolls are so pretty and beautifully made that I was delighted to become Bonnie & Pearl’s first retailer. The dolls are available in 7 different combinations of hair, eye and skin colours. All have closing eyes, vinyl articulated limbs and wigged hair. I really like their body type because they are vinyl from the armpits up and fabric from the armpits down. This means that the dolls look good in strappy dresses but still feel soft and cuddly to hold. You can see all the dolls available here. Bonnie & Pearl also make a wonderful range of dolls clothes and many other brands fit them too. Bonnie & Pearl recommend these dolls for age 8 upwards. I happen to think that they are great dolls for girls from age 6. However, the black doll with curly hair should not be purchased for a girl under the age of 8 because her curly hair is very difficult to manage. You can see all the dolls here. New to Petalina for 2015 is an extensive range of dolls, dolls clothes and accessories by Our Generation, a popular US brand that make a value alternative to the more expensive American Girl. All the Our Generation dolls have skin tone fabric bodies with vinyl limbs and heads that turn in their sockets. Their hair is rooted, silky and soft and their eyes close. The standard dolls arrive dressed in a fashionable outfit. The Deluxe dolls arrive with a second outfit and accessories, and they may or may not have a story book with them. There are also dolls with pierced ears and jewellery and some even have extendable hair. The range of dolls clothes and accessories is just brilliant with lots of tiny doll sized things that my daughter is really enjoying at age 11. Gotz Happy Kidz dolls are all vinyl 50cm dolls that were introduced in 2012. They are made from phthalate free vinyl, have fixed eyes with long fibre eyelashes on the top eyelid and gorgeous rooted hair which is really long and ideal for lots of brushing and styling. Every year some new dolls are introduced and others retired and at the time of writing this there is a really good selection of these dolls available. What is different about these dolls is that they have extra joints in their elbows and knees. You can see in the image of the ballet dancing doll just how nicely these dolls can be posed, but it is a little tricky to achieve because the knees can bend in all directions. Therefore these dolls are recommended for older girls of at least age 6. Another new range that come to Petalina in 2015 was WeGirls, a range of all vinyl, happy, smiling dolls from Poland. The dolls were made by Schildkrot so their quality was assured. However, we didn’t purchase any dolls during 2017 because we started to see WeGirls dolls on Amazon that looked nothing like the beautiful original dolls, but very much an unattractive chinese made doll at a much lower price, rather than the original German made. Kidz ‘n’ Cats dolls have been incredibly popular since their launch in 2009. All of the dolls are designed by Sonya Hartmann and doll production is a Hartmann family affair in Germany. Every year the most popular dolls remain in the collection with some being retired and new dolls being introduced. The most popular Kidz ‘n’ Cats dolls ever is Kidz ‘n’ Cats Grace. The photograph below shows just a few of the dolls from the 2017 collection. Unfortunately the brand has struggled with quality and I would be very careful before you buy any dolls from the 2016 and 2017 collections. There are wig problems galore with many of the 2016 dolls and some of the 2017 dolls have misshapen eyes. Ask for photos before you buy!! The dolls are 46cm and all vinyl with a slimmer build than Gotz and Bonnie & Pearl dolls. They have fixed eyes and wigged hair in various colour combinations, and are highly posable due to 11 joints in all including in their knees, elbows and wrists. Again, these dolls can be posed in endless positions making them popular with not just children but also collectors. Their clothing tends to be very fitted and fastens with real notions without any velcro at all and for this reason Kidz ‘n’ Cats recommend them for girls from the age of 6 and older. I hope you are now at the point that you have more of an idea about the best doll to purchase for your little girl. Just remember, that if your little girl loves her dolls and she is just 5 or 6, think about all the birthdays and Christmas presents needed over the next few years. There is plenty of time to buy dolls suited to older girls when she is the right age. Until she was 10 years old, my daughter Rosie only ever wanted a doll for every birthday and every Christmas present. We would sit in the doll room and I would bring her dolls for her to choose from, before it was put away for the big day. Doll play made Rosie very happy indeed as she grew up and I hope, with the help of our guides, that you will be able to help your little girl enjoy the same happiness as my little girl. Sylvia Natterer dolls are here! Hello Lucy, thank you for your comment. We rescued all the buying guides from the blog before we closed for just this reason. I hope I can keep up to date even though we are no longer selling. Glad you have found the guides useful.